It is not always necessary to climb the peaks to enjoy great views. 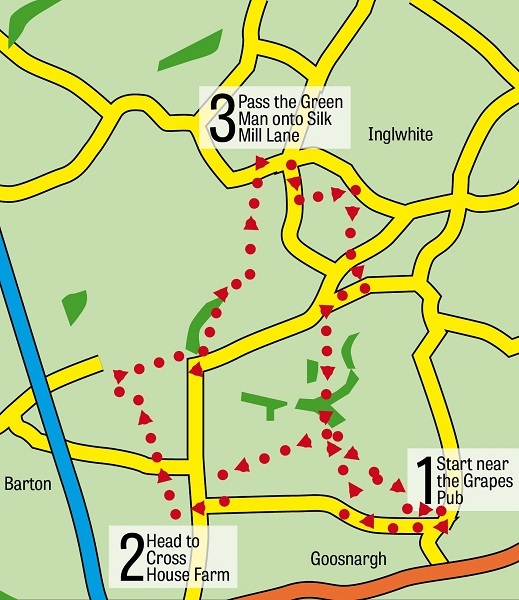 This walk from Goosnargh offers the walker the wonderful scenery of Beacon Fell and the Bowland Hills without the effort of scaling a peak. at Swainson's House (the home of Goosnargh Duck!). This leads onto a farm track. Keep on it as it leads to a complex of buildings at Middleton Hall. bear left crossing the corner to a metal gate. Now in a large field follow the obvious footpath across it to a gateway. follow it left reuniting you with Goosnargh Lane. Turn right. In 200yds reach the junction with Langley Lane. Turn left then almost immediately right onto a farm drive. Keep on this to reach Barton House. Turn right on a drive just in front of it. Keep on the drive for 500yds to arrive at an ancient cross. to reach a field just before Blake Hall. When you reach the drive turn right and follow it to Langley Lane. it all the way to Bilsborrow Lane. Turn right to enter the attractive village of Inglewhite. to go back onto Goosnargh Lane and left again for the village.